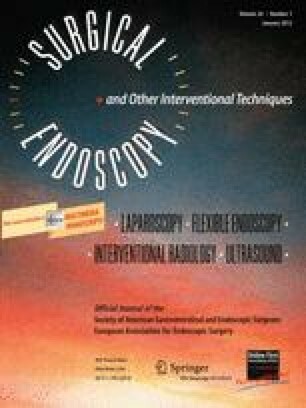 Single-incision laparoscopic surgery is an emerging modality that has proven to be safe and feasible for colon resection in multiple case reports and series. Nonetheless, comparative analyses with established techniques are limited in the published literature. We evaluated the efficacy of single-incision laparoscopic colectomy (SILC) for the treatment of sigmoid disease through a matched-case comparison with conventional laparoscopic colectomy (CLC). Twenty patients who underwent single-incision laparoscopic sigmoid resection for benign or malignant disease between July 2009 and September 2010 were matched to patients who underwent conventional laparoscopic sigmoid colectomy. Demographic, intraoperative, and postoperative data were assessed. Twenty SILC and CLC cases each were paired based on gender (p < 1.0), age (p < 0.47), pathology (p < 1.0), and surgical procedure (p < 1.0). Ten patients (50%) in the SILC group and eight patients (40%) in the CLC group had a history of prior abdominal surgery (p < 0.53). There were no conversions to open surgery; however, one SILC procedure (5%) required conversion to CLC (p < 0.31). There was no significant difference in mean operating time between groups (p < 0.80). Mean estimated blood loss was significantly lower for SILC compared to CLC (p < 0.007). Mean lymph node extraction was comparable between groups in the subset of patients with malignant disease (p < 0.68). Two postoperative complications were encountered in each group. The mean length of hospital stay for SILC and CLC was 3.2 ± 1.0 and 3.8 ± 2.1 days, respectively (p < 0.25). There were no readmissions or reoperative interventions in either group. Compared with conventional laparoscopic technique, single-incision laparoscopic surgery results in similar intraoperative and postoperative outcomes. The technique avoids use of multiple trocar sites and may safely be performed in patients with a history of previous abdominal surgery while maintaining a short length of hospital stay and low complication rate. Presented at the SAGES 2011 Annual Meeting, March 30–April 2, 2011, San Antonio, TX. Dr. Pickron is a preceptor for Applied Medical (Rancho Santa Margarita, CA, USA) and Ethicon Endo-Surgery (Cincinnati, OH, USA). Dr. Haas is a preceptor for Applied Medical (Rancho Santa Margarita, CA, USA). Drs. Ramos-Valadez, Ragupathi, Nieto, Patel, and Miller have no conflicts of interest or financial ties to disclose.